We are seeing this error on some traces when trying to add phones to a meet me conference (more than 30 participants). On service parameters the participants limit for meet me conferences is more than 100. The IPVMS limit for each server is the default of 48 streams. Having an MRG assigned to the phone which has much more than one CFB, the attempt of joining the conference fails when the 48 streams from the first CFB from the list are used. 11/25/2010 16:44:39.912 CCM|UnicastBridgeControl - ERROR CcSetup failed - no streams available -- Ci = 121017196, ConferenceId= 117445904, Cdpn=b00703221016|. How come its not jumping to the next CFB from the list? Are we missing something? A single conference call will only use a single bridge. Your debug shows this because it is only attempting to allocate a stream from the already-allocated bridge resource. It is not searching the MRGL for other bridges to use. If you want to exceed it's capacity you will need to link two calls together manually using an ad-hoc conference. To be honest for this type of scale you should be using MeetingPlace; this is way beyond what MeetMe was intended to be used for. How do we enable it so that if an internal user at DN 1234, want to call 2345, but are entering the full 0 + 8 digit dial string, does not go through the GW. ( we are using 4 digit for internal calls, 8 for external + 0 ) . Some of the internal users are entering the full dial string, as if they where to call local extension. We want the Translation Pattern , to be set up so that if an internal caller, want to dial another internal user, and he is entering 0 + 8 digit, then my CUCM should strip some digits of, and see that this is meant to be an call from internal to internal users. We know that this should be possible. We are using 4 CSS. Int, Norm, Foreign and All. You need to use translation patterns. 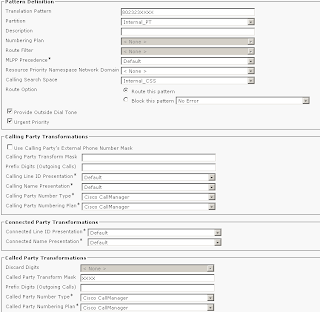 Create a new translation pattern in the same partition as your phone directory numbers. For each DID range that you have enter the full number that a user would dial to reach the phones including the 8 access code and XXXX for the last four digits. 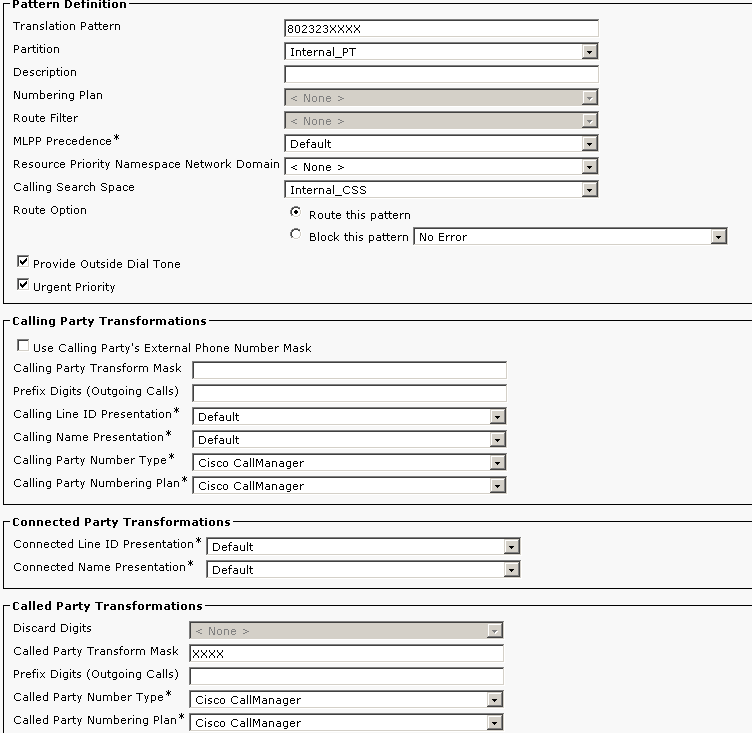 Assign a Calling Search space that allows the translation pattern access to the partition containing the phone directory numbers. Enter XXXX as the Called Party Transformation Mask. The image below shows a translation pattern configured on CUCM 7 configured as described above - CCM4 should be similar. Is there a document which summarizes the devices which support GRE in hardware and the limitations ? is it correct that the entry level for h/w based GRE is the SUP32 PISA ? Is there no hardware support for GRE in the 4500, even with 10Gb Sup ? On 6k, Sups running in PFC-3B mode and up will support GRE in hardware. Use "show platform hardware pfc mode" to verify. On 4500, the sup7E has the capabilities for hardware support, but I don't think the software has yet been released to support GRE in hardware. Last I can find, the software release was aimed at post-launch, which I believe just came recently in August or so. How to connect to Internet through 1 interface and Vpn through another interface? We are trying to setup a environment where we want Vlans 1 and 2 to communicate with each other through inter-vlan routing. Vlan 2 should be accessed through the VPN tunnel on the from the other end. These should however be no access to Vlan 1 through the vpn tunnel. Finally we want both vlan 1 and vlan 2 to connect to the internet through another interface of the router. access-list 101 permit ip host 10.2.16.2 10.10.10.0 0.0.0.255? Even if we configure L3 to perform inter-vlan routing how will traffic be passing from the lan to the internet and for vpn connectivity. What will happen to the already existing acl 101 which is responsible for vpn traffic. ip nat inside source list 101 interface s0/0/1 overload. You should use an unused acl number for the NAT, between 100 - 199. It's not changing to L3 inter-vlan routing on the switch would make it work, it's just that if you have a L3 switch in your network it's usually better to use it for it's intended purpose. If the amount of traffic between vlan 1 and vlan 2 is not that much then you can stick with what you have but L3 switches provide much better throughput generally than equivalent routers so the interface on the router you are using sub interface on could actually become a bottleneck between the 2 vlans.